We’re loving: natural and outdoor weddings! Love the soft and romantic natural wedding vibe? We do, too! The birch, knotty pine, twigs, succulents, pine cones, fresh-cut leafy greens and that peaceful outdoor setting – we can’t get enough. 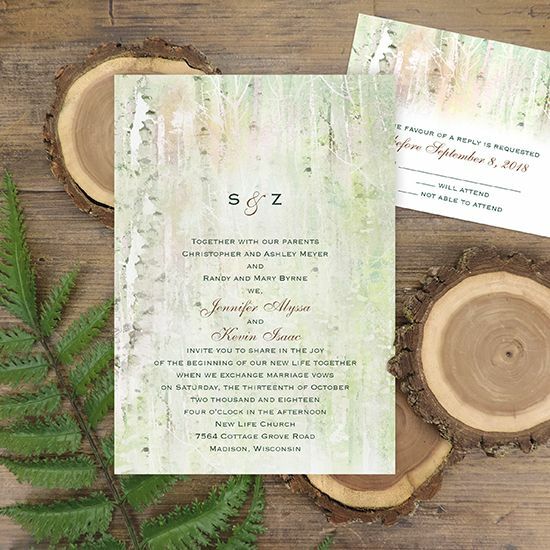 And that’s exactly why we love our Into the Forest invitation. 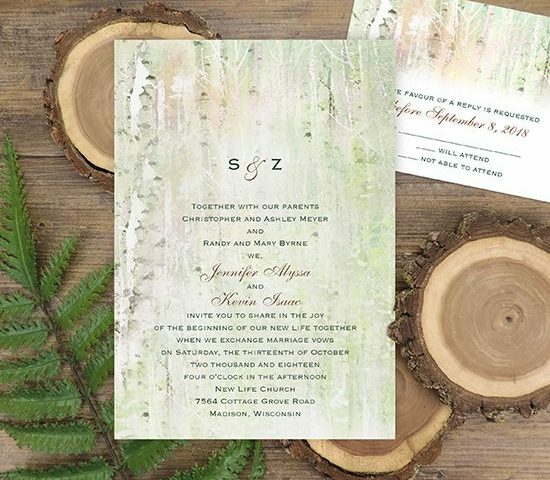 This woodsy invitation features a soft birch forest design, creating the perfect introduction to your big day. Incorporating the romantic, natural theme throughout the rest of your day is simple – just let nature do the work! Add touches of natural beauty to your wedding attire by using twigs, ferns or even sprigs of cotton in your boutonnieres and bouquets, and pinning stems of greens and delicate flowers to your updo. Decorate using real wood slabs with leafy green arrangements as your centerpieces and pinecones as place card holders. For an extra special treat, serve your guests fresh-baked pie instead of cake. Create unique vignettes using flea market finds like like old desks or tables, or even using your own outdoor furniture from your house to serve goodies, display favors or place cards and even pictures of the bride and groom in pretty frames.. This theme is so popular you can get all sorts of reception and party accessories to match such as menu’s, table numbers, seating charts, place cards, favors, signage, and more!